GPS receiver for PDA with Compact Flash slot (type I and II). 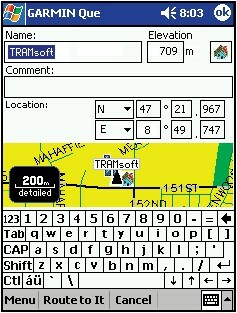 Includes navigation software for PDAs with operating system Pocket PC and Windows Mobile. Supports auto-routing with visual and voice guidance. There is 64 MB of built-in memory to store base and detailed maps. Well suited as a hand held device or to be used in all kinds of vehicles. 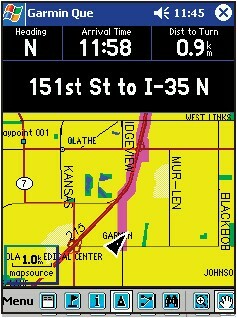 The GARMIN cfQue 1620 turns your Personal Digital Assistant (PDA) into a perfect navigation system. 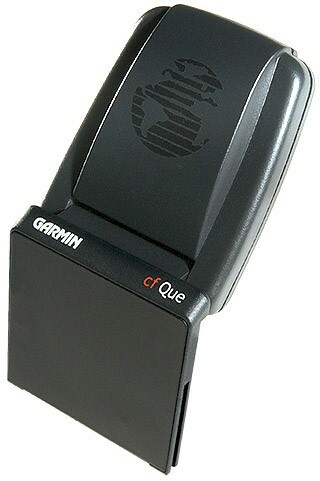 The GARMIN cfQue 1620 combined with the included software GARMIN Que provides automatic route calculation plus visual and voice guidance. The cfQue 1620 comes with loadable base maps of America; Europe, Africa and the near East; Asia and Oceania and a world map plus detailed maps of Europe. There is 64 MB of built-in memory to store even more detailed information, such as local roads, restaurants and other points of interest. The package also includes an universal PDA mounting kit with a removable base and does not require any installation. 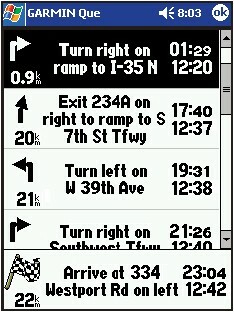 The cfQue 1620 provides navigation information outdoors, in a car, in a train or even in an airplane (see MapSource examples). Very sensitive 12 channel receiver with flip-up antenna. Adaptor for Compact Flash slot (CF slot type I or II). Multilingual user interface in English, French, Italian, German and Spanish. 4 installable base maps: America; Europe, Africa and the near East; Asia and Oceania plus a world map. 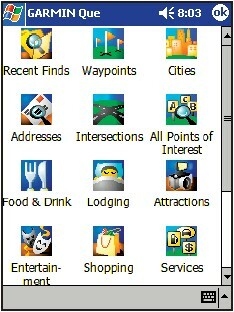 64 MB built-in memory to download additional, even more detailed maps with roads, crossings, addresses of restaurants, public buildings and other points of interest from a PC (memory only available for base and detailed maps). Suited as a hand held device or to be used in any kind of vehicles. Universal PDA mounting kit with removeable base included, does not require any installation. CDrom with navigation software and detailed maps included, provides installation wizzard, data exchange with PC and supports installation of detailed maps. Requires PDA with Pocket PC 2002-2003 or Windows Mobile. Automatic computing of a route to a user selected destination including via-points. Guidance on the display (visual guidance) and voice guidance via loudspeaker (acoustic guidance). 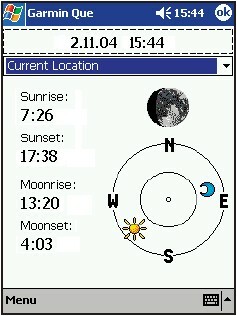 Information about the position of the GPS satellites and about the quality of the signals. Map with zoom function in the range of 1200 km to 30 m (800 mi to 120 ft). Extended search function for points of interest, addresses and intersections, if there is a MapSource map available in memory. A CDrom with maps of Europe and an unlock code for these maps are included. If you buy additional maps, you have to request an unlock code from GARMIN via Internet. 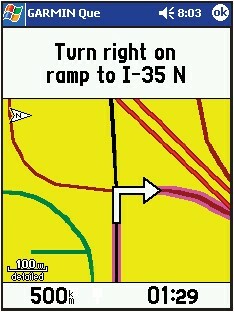 A Windows PC is required to transfer maps to the GPS device. 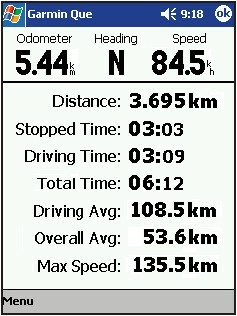 Stores waypoints with name, icon (choice of 88 symbols), coordinates and altitude. Store resultats of search in contacts. Provides direct search for addresses stored in contacts. Stores pre-computed routes for fast activation. Stores up to 25 travelled routes (tracks). Supports various recording modes. All options for the GARMIN cfQue 1620 in detail, find maps here. 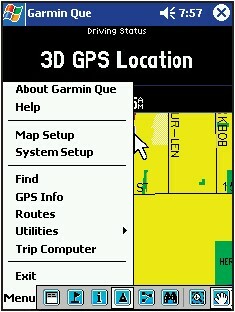 GARMIN Que is the navigation software for PDAs with the operating systems Pocket PC and Windows Mobile for the GARMIN cfQue 1620. Note: You may configure the main pages through options. The screenshots below are just examples, the actual appearance may vary from the pages shown below depending on the current settings. Especially the content of the data fields is user configurable. You can choose from many different values. The content of the data fields is user configurable. You can choose from many different values.